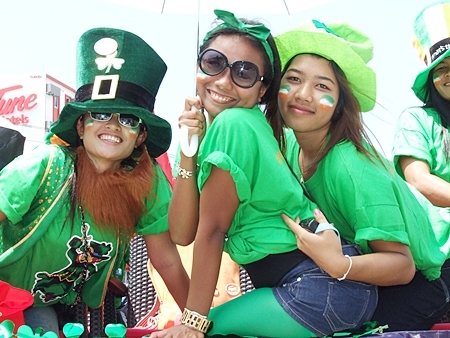 Irish eyes were smiling on Pattaya March 17 as the city celebrated St. Patrick’s Day with a parade and cultural festival. 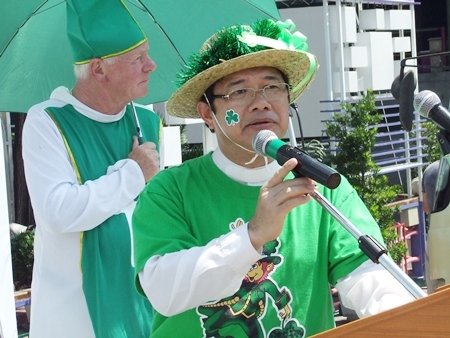 Mayor Itthiphol Kunplome, officials from the Father Ray Foundation and St. Patrick’s Day Parade grandmaster Derrick Kane opened the festivities outside the Alcazar Theater where merchants pitched tents offering Irish food, green beer and knick-knacks from lucky hats to four-leaf clover key chains. 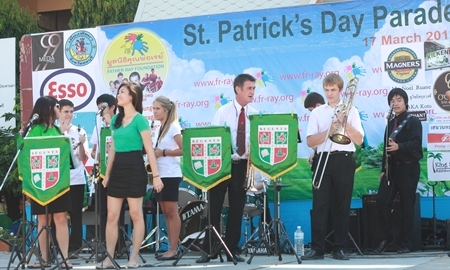 Bands played Irish music and from Thais to Russians attending, all agreed that everyone was Irish on St. Patty’s Day. 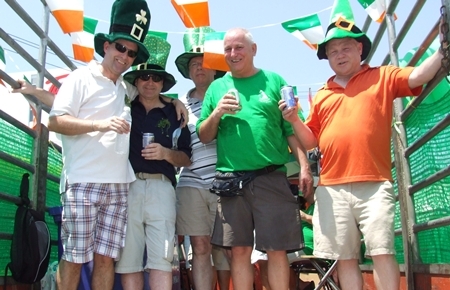 You don’t have to be Irish to enjoy St Paddy’s Day. 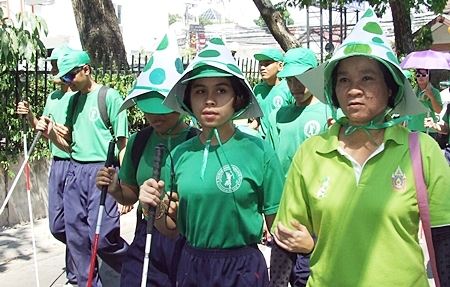 Hundreds of people, both Irish by descent and those who became Irish for a day, donned green on March 17 to remember the work of St. Patrick, who helped establish many schools and churches in Ireland. 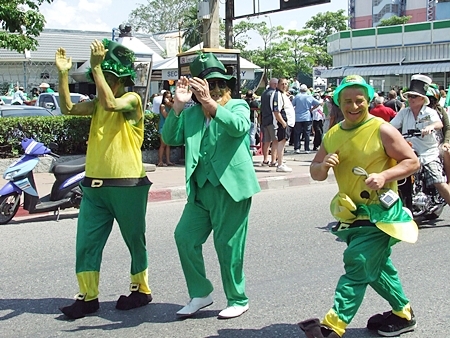 For the second straight year, the city hosted a St. Patrick’s Day parade, this year with an added celebration featuring Irish food and music at School #8 in South Pattaya. 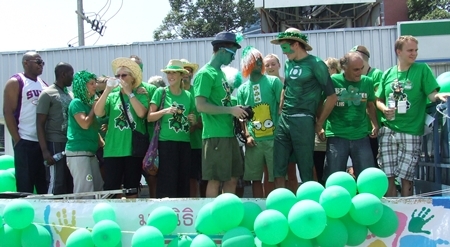 After the big buildup, the floats began to roll at 2 p.m., led by the civil defense volunteers from Thappraya 2310, followed by an Irish group dressed in all-green, bringing smiles to the faces of fans lining the street. 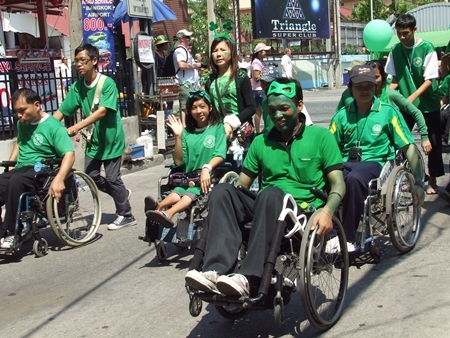 Paraders marched and drove down Soi 4 to Beach Road, along the shoreline to South Road, ending up at Pattaya School No. 8. 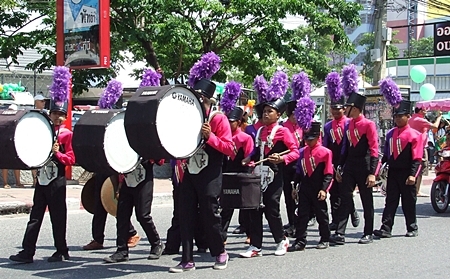 The marching band from School No. 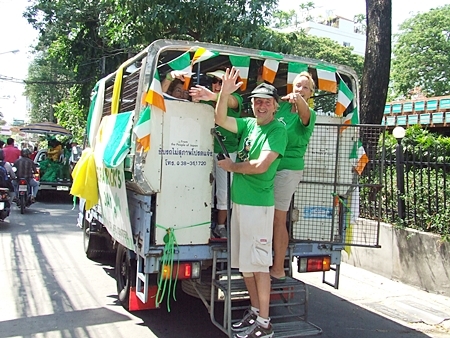 1 brought up the rear, playing Irish classics. 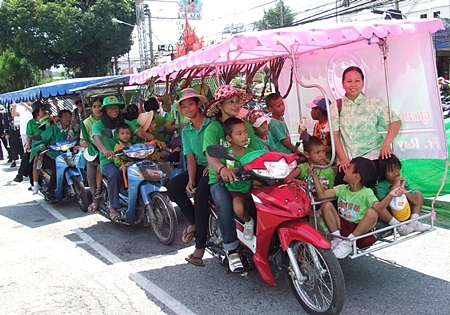 Along the way every car, person and motorcycle seemed to be decked out in green. 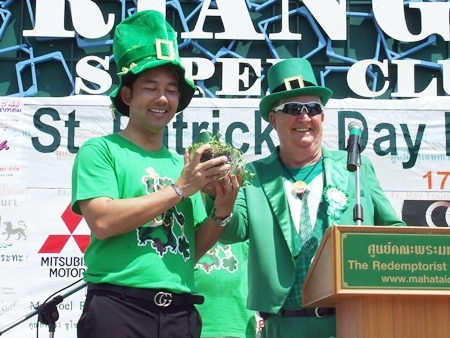 Mayor Itthiphol Kunplome (left) happily accepts a pot of 3-leaf clovers from Derrick Kane, grand marshal of the festival. 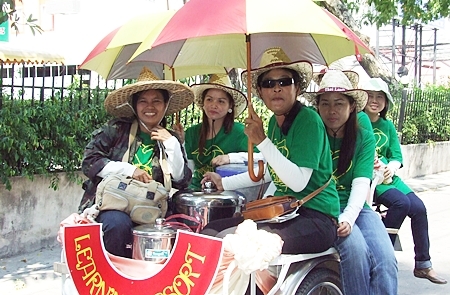 Once at Pattaya School No. 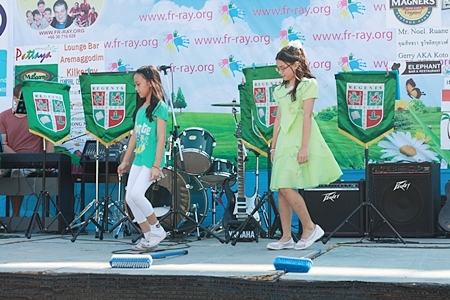 8, the festivities continued with stage performances by school children, music, dance and plenty of “green” beer for the audience. 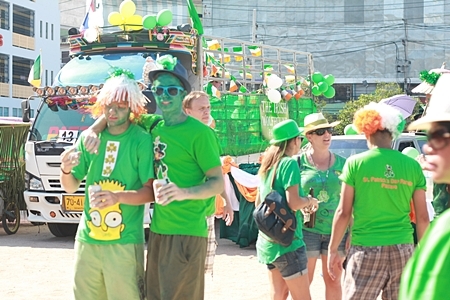 This was the second St. Patrick’s Day in Pattaya and a far grander affair than last year. Kane thanked the mayor for backing the event, offering him a pot of clovers as souvenir. One can only hope that a 4-leaf clover may eventually grow out of the cluster. Fr. Picharn Jaiseri welcomes everyone to the event and says thank you for all the wonderful help. 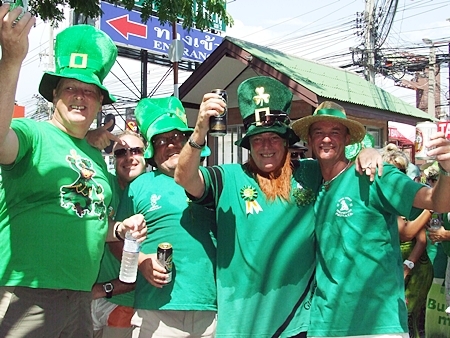 For his part, the mayor wants to make the Irish holiday, named for the benevolent saint who died in 461, Asia’s largest celebration so that St. Patrick’s Day becomes synonymous with St. Pattaya’s Day. 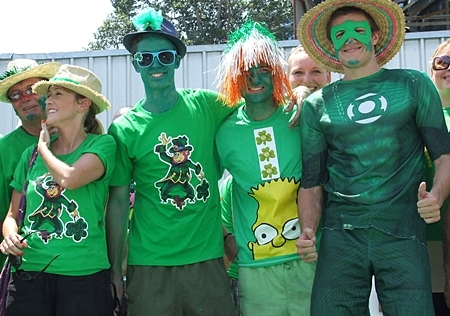 Irish eyes are smiling on these colorful lads and lassies. 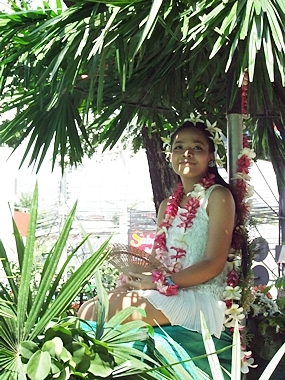 Keeping cool whilst riding a float in the parade. The Regent’s Band entertains the crowd. 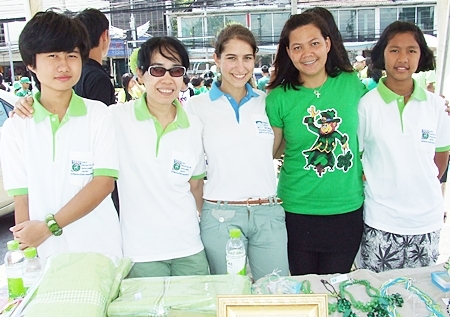 Hanging out with members of the Human Help Network Foundation Pattaya. 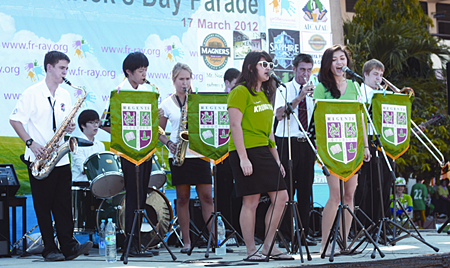 Regent’s students perform a St Patrick’s Day jig. 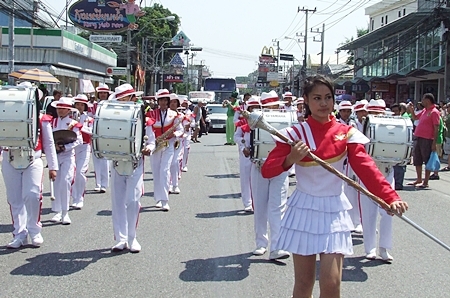 A parade wouldn’t be a parade without a marching band, in this case perfectly supplied by School No. 3. It’s great fun for everyone! 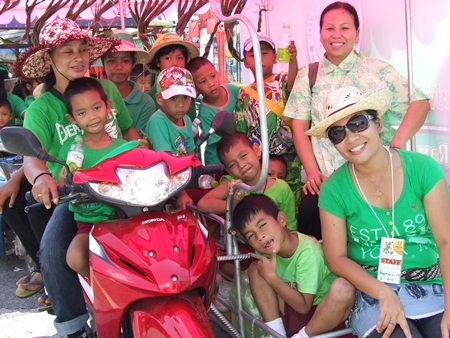 Tuk Tuk loaded to the hilt with green kids from Father Ray’s.